You may have an idea of the awning you want in your mind, but before you can progress any further you’ll need to know what to look for. 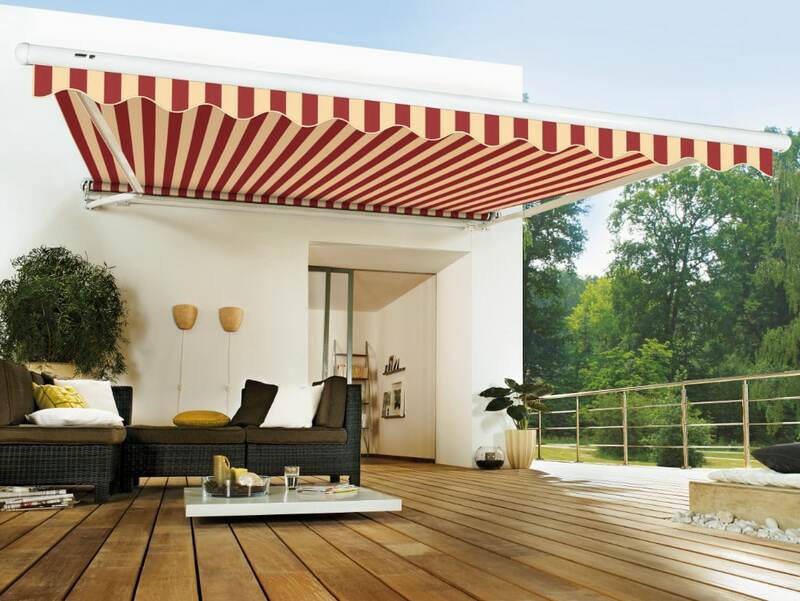 Most awning companies categorise the different awning types in the same way. Read on to understand a little more about your options. When most people think of an awning, they have a wall mounted patio design in mind. 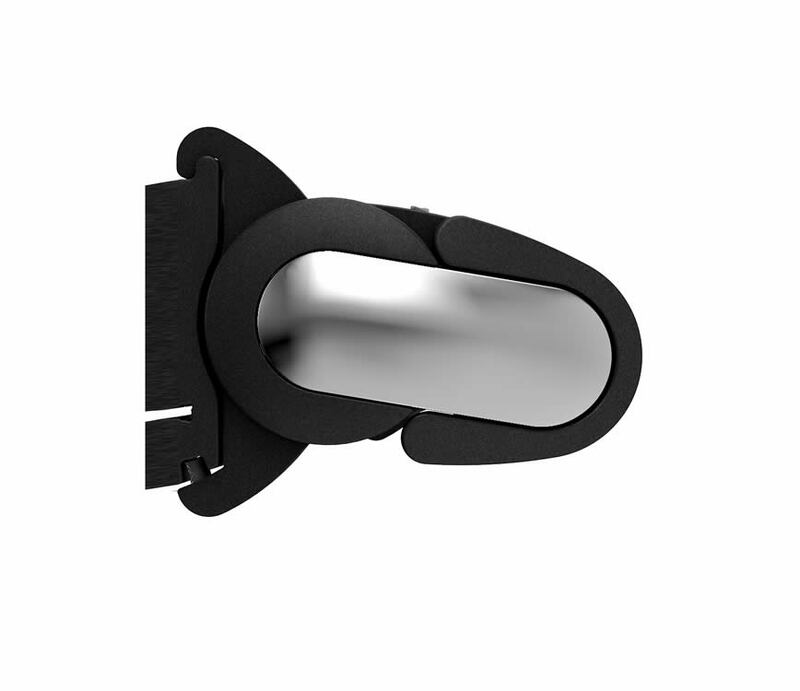 These are fixed to a wall and extend outwards over a seating or smoking area. Veranda awnings are wall mounted like a patio awning, but have a fixed frame design which stays in place when the awning is retracted. 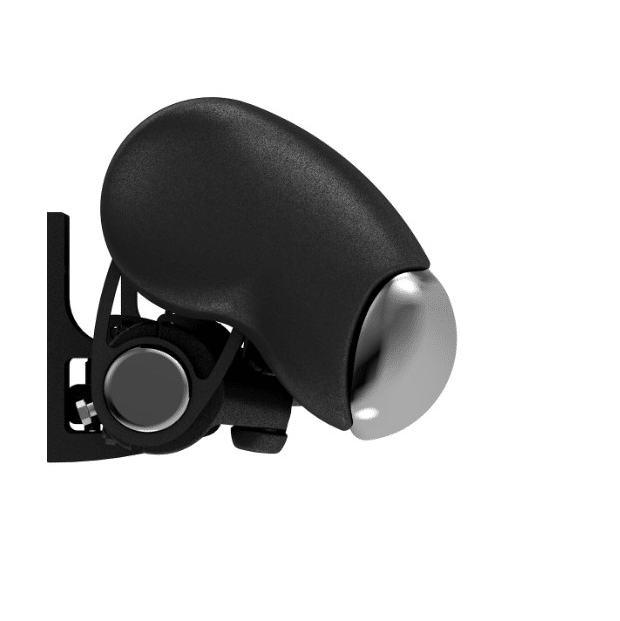 They benefit from the extra stability offered by additional front support posts. As their name suggests, these designs don’t require wall mounting. They are a freestanding structural framework which patio awning(s) are fixed onto. Freestanding awnings are popular in open spaces, and their extra sturdy construction means they can cover large spaces like restaurants, poolside areas and lawns. The patio awnings are purchased separately, giving flexibility over your choice of model. When providing a quotation we will provide a total cost. Conservatory awnings have a unique framework which is mounted to an existing roof structure. Internal designs provide shading from under the glass, while external designs are fitted over it. 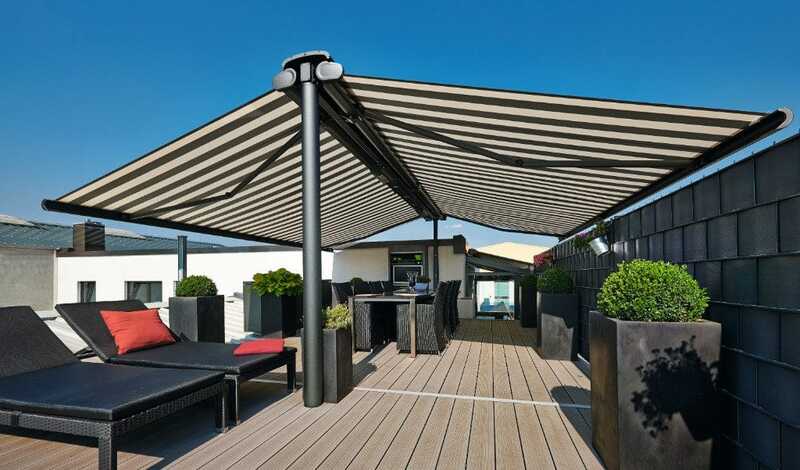 Markilux and Weinor’s hardwearing awning fabrics are capable of withstanding outdoor conditions, offering the unique benefit of being able to block sun rays before they touch the glass. 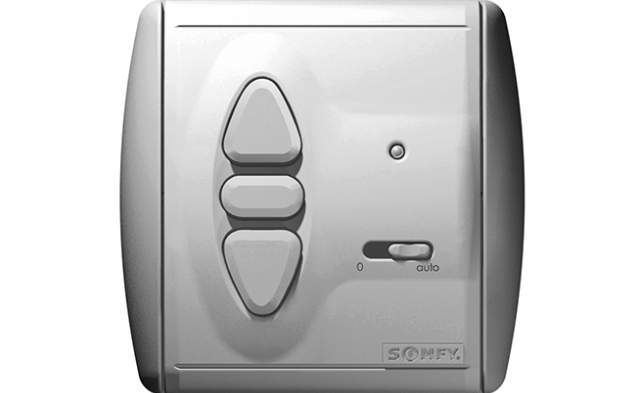 This provides improved temperature control, and both types can be operated with a remote control. 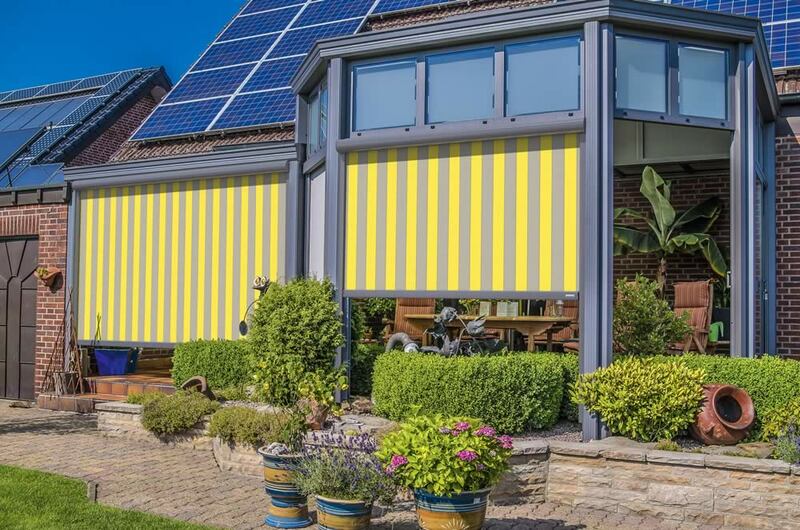 Vertical awnings could be described as a state-of-the-art window blind. 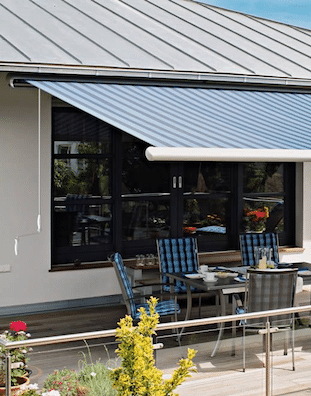 They combine retractable awning technology with weatherproof awning fabrics, and are therefore usually fitted outside the window, although they can be installed internally too. Some benefit from a drop-arm design, which means they extend away from the wall at the bottom for the perfect angle of shading. The Weinor Paravento and Markilux 790 are side blinds and therefore slightly different. They are used to add privacy and shading to the side of a patio area, fitted vertically to a wall and extending outwards horizontally. All Markilux and Weinor awnings are robust enough to withstand the challenging conditions a commercial awning endures. For this reason, products which are typically used domestically can also be used within sectors such as hospitality and retail. They provide a unique opportunity to increase usable floor space, improve aesthetics and raise brand awareness. Certain products are better suited to covering larger areas, and a full cassette may be required to protect against vandalism. Options such as signwriting may also be beneficial. Roché’s commercial team liaise with architects, builders, project managers and business owners to create the perfect solution. When the awning is retracted the roller, fabric and arms are all stored away inside a built-in casing. Full cassette designs offer the highest level of protection from rain, wind, frost and snow, as well as dirt and vandalism. A full cassette isn’t always necessary, since most gardens offer a little protection in the form of fences to block side winds or a roof overhang above the installation. If you don’t need the protection, you can expand your options by looking at semi cassette and open awnings too. Vertical and conservatory awnings are only available with a full cassette. A middle ground between open and full cassette designs. These awnings provide some protection from the elements by being partially enclosed, from above and usually from the sides too. The underside of the awning will remain open when retracted, but the installation will still be well protected from rain, wind and snow. An open awning doesn’t have a cassette enclosure. 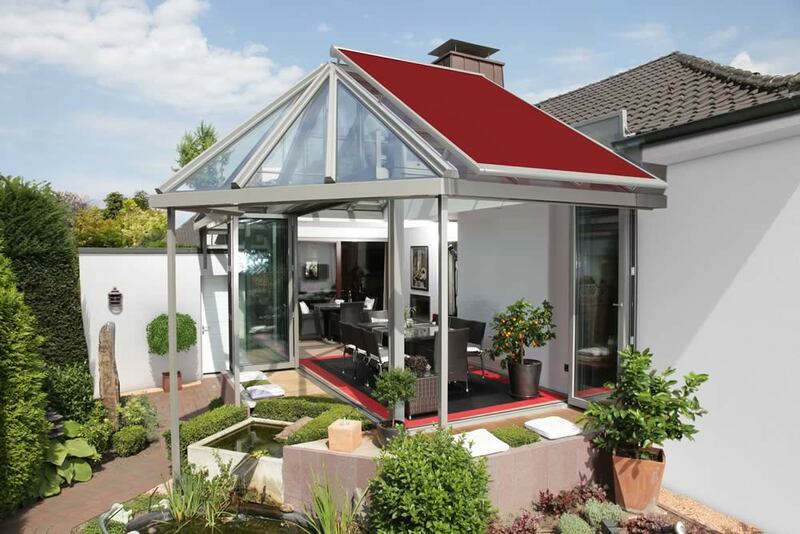 If your garden already offers adequate protection, an open awning gives a lightweight appearance. Coverboards are usually fixed to the wall above the awning, acting as a roof overhang if you don’t already have one. Sometimes coverboards are fitted to the awning instead. Retractable awnings can be opened and closed when required, with the arms folding away and the cover winding onto a barrel. Different operation types are available. An electric awning is a preferable choice for most people as it makes operating the installation effortless. A tube (or tubular) motor is concealed neatly away within the barrel, referred to as this because of its space-saving shape. It will be connected into your electricity supply and operated via a switch or remote control handset. 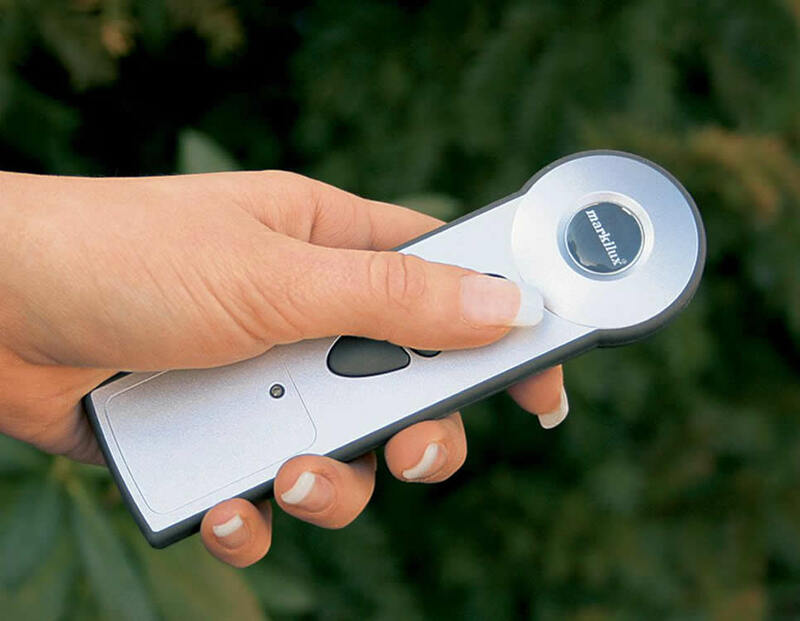 Remote control offers the ultimate in convenience. It is also possible to control accessories like heating and lighting from a multi channel remote control. 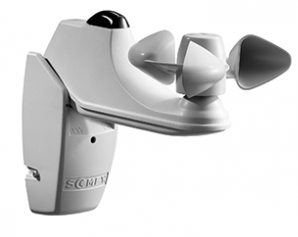 Sun and/or wind sensors are an additional option which helps your awning take care of itself. 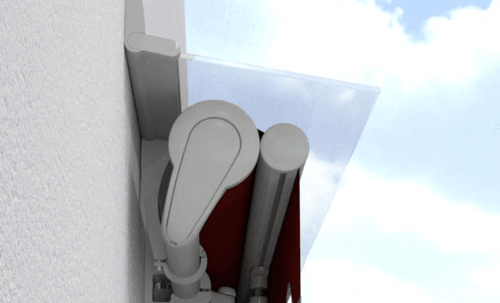 Sun sensors will extend the awning so it’s always ready for you on a beautiful day, while wind sensors will retract it to prevent the mechanism from getting damaged. 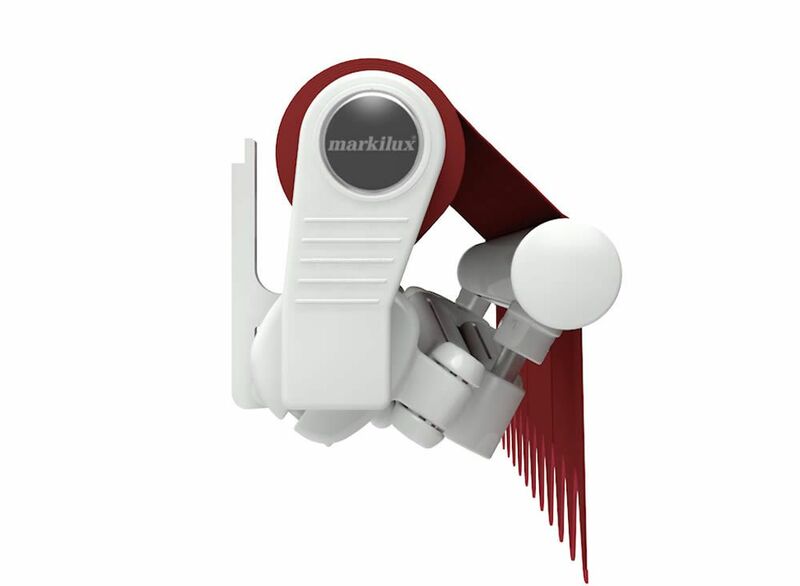 Roché recommend a built-in wind vibration sensor for all awnings. Some sensors are solar powered, while others are wired into your electricity supply. With manual operation, the awning is operated using a crank handle. You simply hook the handle onto the awning and turn to open and close the cover. 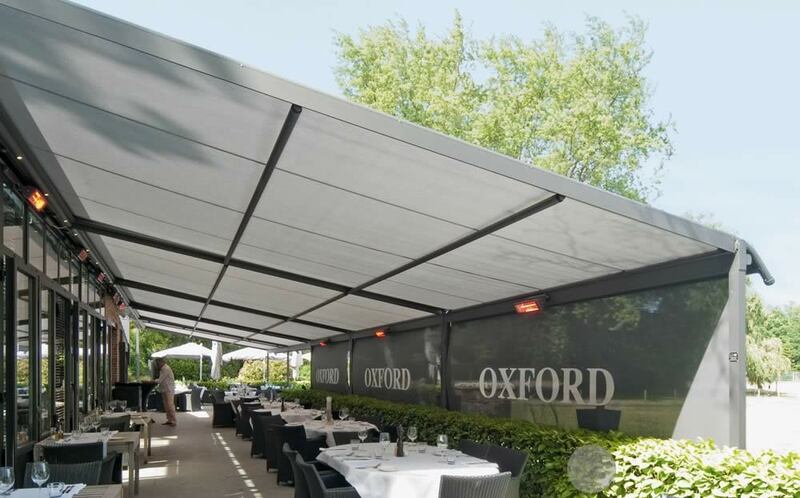 Manual operation is most suitable for awnings which aren’t anywhere near an electricity supply, such as a freestanding awning in an open space.